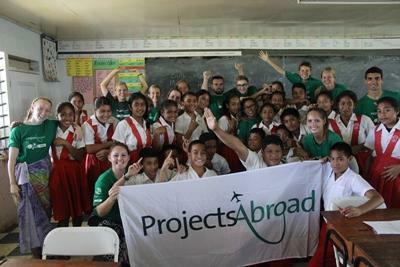 Set up your own fundraising page on your personal 'MyProjectsAbroad' web page. This is available once you've been accepted onto a project; you can then give the link to anyone interested in donating towards your project fee. Cut down on expenditure and resist the temptation to buy things you really won't need – check out the kit-list we provide on your 'My ProjectsAbroad' web page. These often need planning in advance, but can be really rewarding. Make posters and e-mail all your friends so as many people support you as possible. Why not contact your local radio or newspaper to attract sponsors as well as promote the ones you have? Think about who you know - anyone in a band? An owner of a bar or restaurant? Our Fundraising Guide is packed with inventive ideas. Do not underestimate the value of ordinary work! Here is an example of how a part time job can help: Working for £5 an hour for 4 hours twice a week earns £40 per week - £160 per month - £1920 a year! Finally, we are here to help and many of us, once volunteers like you, have embarked on our own weird and wonderful methods of fundraising. Remember that motivation and organisation are the keys to success. Good luck! Participating in a volunteer project abroad is possible on any budget and we are always looking for ways to keep costs low and help our volunteers fund their experience. Take a look at our tips for budget volunteer trips. Looking for some creative fundraising ideas? We've also rounded up some tried-and-tested fundraising methods from former volunteers.